Even though we still have over four weeks till the kids go back to school here in Connecticut, there are many regions that head back in the beginning of August. So it is about that time to start planning for supplies and school clothes and also your child's lunches. Every year I start off all gung-ho with my bento style lunches for the kids, but after a month that quickly loses steam. I'm tired of packing the same old thing and my kids are tired of eating it. I tend to mix up sending home lunches with the kids buying hot lunch, but school lunches are the complete opposite of healthy and I'd like to get back to only doing that for pizza day on Friday. Thankfully now there is a place where you can get tons of lunch ideas! Gosh you have no idea how much the tip for the picky eater are going to help me. Having one picky eater is hard enough, but four? GAH! At Rock the Lunch Box, parents can also submit their own lunch box creations and be entered to win goodies from each of the participating companies. Plus you can browse lots of ideas from other parents and hopefully find a lot of lunch ideas that will work for you and download coupons. This is an example of what I would send in for my eight year old son. He loves when I send in leftover cold pizza (pssssst, Annie's makes frozen pizzas now!!). Along with the pizza I have mixed fruit of watermelon, cantaloupe and strawberries; cucumbers; Honest Kids juice pouch; Stonyfield YoKids yogurt and Annie's Cheddar Bunnies. Now this lunch would be for my three year old. 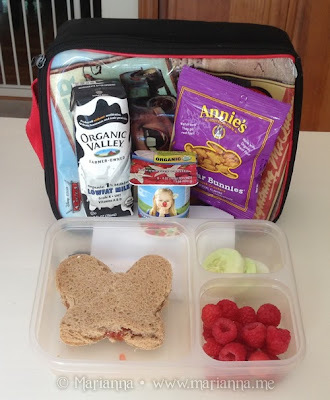 We have a peanut butter and jelly sandwich cut into a shape with a cookie cutter; raspberries; cucumber; Organic Valley shelf stable milk box, Stonyfield YoKids yogurt and again Annie's Cheddar Bunnies. My kids love those Cheddar Bunnies! Are you ready for back to school time yet? What do you pack for your child's lunch? One (1) winner will receive a "Rock the Lunchbox" lunchsack filled with coupons and/or products from Stonyfield, Annie's, Honest Kids, and Organic Valley. Open to US residents only, 18+. giveaway ends on August 1, 2013. Please use the Rafflecopter form below. Good luck! I received sample product for use in my post. All thoughts and opinions are my own. My girls love when I pack grilled cheese and tomato soup in their lunch. They also like everything cut into fun shapes to create a different theme everyday. Juice boxes were always a hit with my kids. I also packed containers with a small salad or carrot sticks and a healthy snack. i'm always a hero when I pack lunchables, super easy for me! Let them pack their own as soon as possible. ham and cheese sandwich, juice, celery sticks, and cookies. When I am in a pinch and short on time I will grab a tuna pouch since it doesn't need refrigerated. I will then add some bread and a piece of fruit and I have a packed lunch that doesn't need to be kept cold. My kids love when I put homemade stew or chili in their lunch. 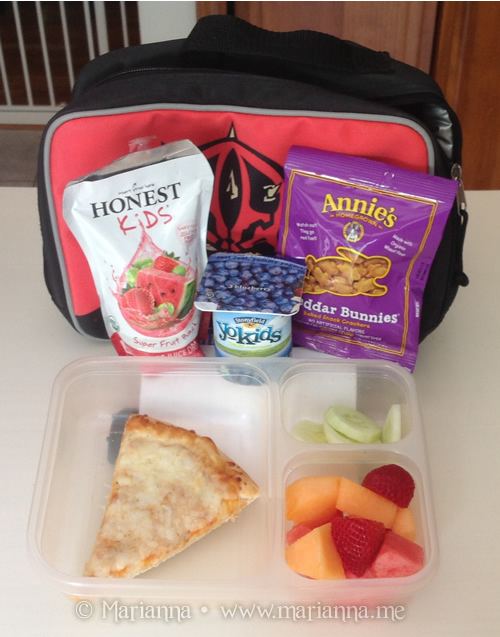 Their friends at school are always drooling over my kids fun, healthy lunches! lunch meat roll-up instead of a sandwich! I like to serve a nice salad topped with yummy homemade tuna or chicken salad, grapes & cheese, diced cucumbers and a juice box. Peanut butter and jelly, chips and a banana. Sandwich pinwheels. They even make gluten free wraps now! Sandwiches cut into shapes were always a hit with me...that and a cute ice pack to keep the juice nice and cold! My daughter takes yogurt, cheese stick, and a granola bar. She usually packs her own lunch. My son loves pb&j, a squeeze yogurt, some fruit, and a juice pouch or milk box. We love vegi sushi for lunch. PB&J sandwich, chips, cookies and juice. My kids love dried fruit as part of lunch. My daughter is learning all of her alphabets so I like cutting a new letter out of her sandwich she takes to school. Sandwich cutouts, fresh fruit, and string cheese. Pack healthy snacks instead of junk food - chips -candy. I always try to cut sandwiches into shapes and sometimes cheese too. When my son was little, my husband and I took turn drawing funny faces on his bananas. He always looked forward to seeing the banana a lunch.